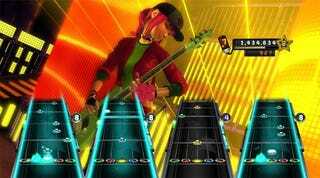 Activision is catching legal heat from band No Doubt over the group's appearance in the recently released Band Hero. No Doubt is suing Activision, seeking damages for turning the act into "virtual karaoke players." Sound familiar? Furthermore, individual band members can be "isolated into solo performances of these cover songs and placed randomly in countless variations." According to No Doubt's claim, that goes against the contract it signed with Activision granting its likeness in Band Hero. It also contends that Activision refused to change the band's appearance beyond the agreed songs, saying that catering to No Doubt's request would be "too expensive." The publisher of Band Hero raised the ire of Kurt Cobain's widow Courtney Love—as well as former Nirvana members Dave Grohl and Krist Novoselic—for the singer's inclusion in Guitar Hero 5. In that game, the late Cobain could be used in non-Nirvana songs, performing any instrument, resulting in hastily Twittered fury from Love and requests from her attorneys to limit the musician's appearance in the game. No Doubt is seeking an injunction and damages in the suit. We've contacted Activision to get its side of the story and will update with comment, should it provide any. Update: Activision has responded with the following statement: "Some of the world's most popular and iconic artists have been featured in Guitar Hero as playable characters, and we are proud to count No Doubt among them. Activision has a written agreement to use No Doubt in Band Hero – an agreement signed by No Doubt after extensive negotiations with its representatives, who collectively have decades of experience in the entertainment industry. Pursuant to that agreement, Activision worked with No Doubt and the band's management in developing Band Hero. As a result, Activision believes it is within its legal rights with respect to the use and portrayal of the band members in the game and that this lawsuit is without merit. Activision is exploring its own legal options with respect to No Doubt's obligations under the agreement."